Tourism is highly exigent in term of water consumption and this can be really critical especially in the Mediterranean region, where the peak is concentrated during summer and the water source is less available and more vulnerable; every tourist can consumes between 300 and 850 litres of water per day, but this rate can be also more considering other kind of “indirect” sources of consumption such green areas and sport facilities irrigation, water losses compensation in swimming pools, water games or fountains, or the increasing water consumption of shops, bar, restaurant and any other activities related to furnish adequate services to tourists. Moreover, part of this great volume of water is polluted during its usage and it requires to be treated. 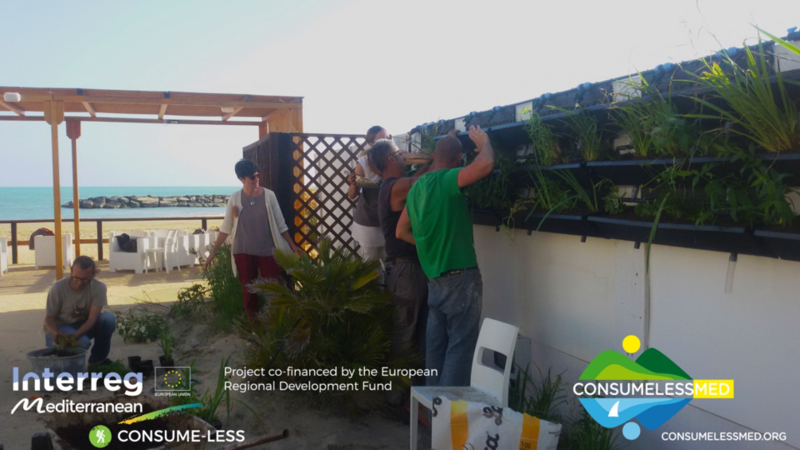 Hosting, entertaining and supplying the increasing number of tourists along the limited space of the Mediterranean coast generate an heavy impact on the environment that can be paid dearly. But in a context of increasing challenges towards a more sustainable tourism, we have a “new” ally: Nature! Indeed, Nature-Based Solutions (NBS) can play a big role in making more sustainable the water management in the touristic field. NBSs were defined by the recent UN Word Water Development Report as solutions “inspiredand supported by nature and use, or mimic,natural processes to contribute to the improvedmanagement of water”. Among the many NBS available now, green walls can have a great potentiality for eco-touristic sector. Green walls, as every NBS, can be multi-purpose. This means that we can reach multiple goals with only one solution. Nature never does only one thing at a time! Therefore, green walls can be, at the same time, nice, practical for the touristic facility, and useful for more holistic goals. An example is the biodiversity lost challenge, among the most relevant evidenced by the recent Planetary boundaries of the Stockholm Resilience Centre. Why don’t you reduce water consumption, green your walls, and contribute in saving the world with a unique solutions? 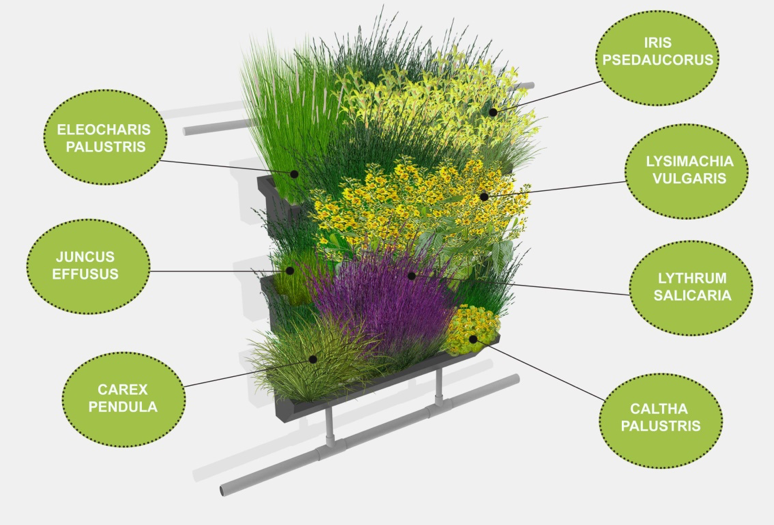 Indeed, green walls for greywater treatment can be your “next door“ hotspot of biodiversity! 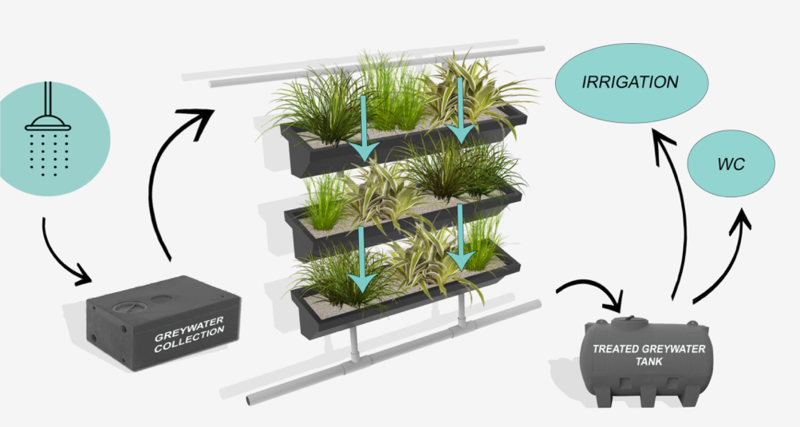 Although intense research is developing to optimize the use, green walls for greywater treatment and reuse are already reality! 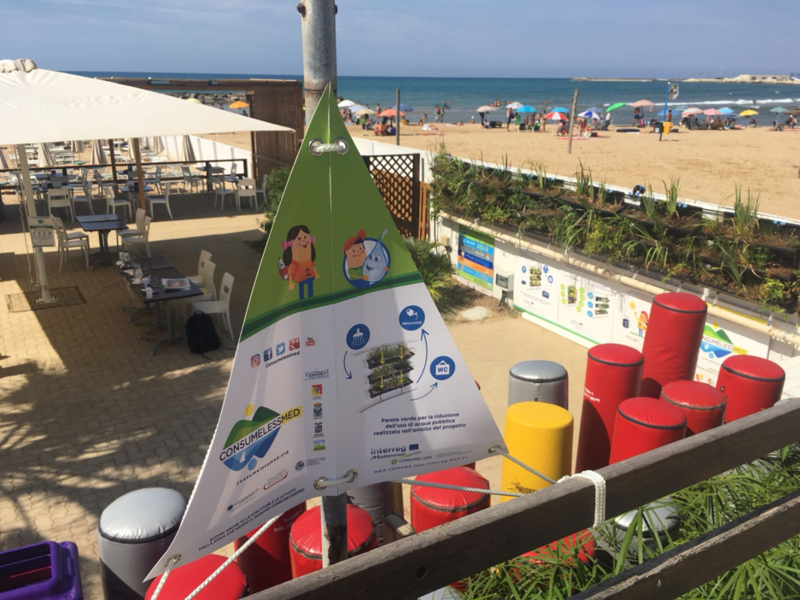 An example is the demonstrative action located in a beach facility along the Marina di Ragusa seafront, the Margarita Beach. During summer, the site is largely frequented by tourists and local people and the water consumption is very high. This is more evident in the weekends and in August, mainly due to the presence of WCs and external showers that are used both by the clients of Margarita Beach and by the other people. 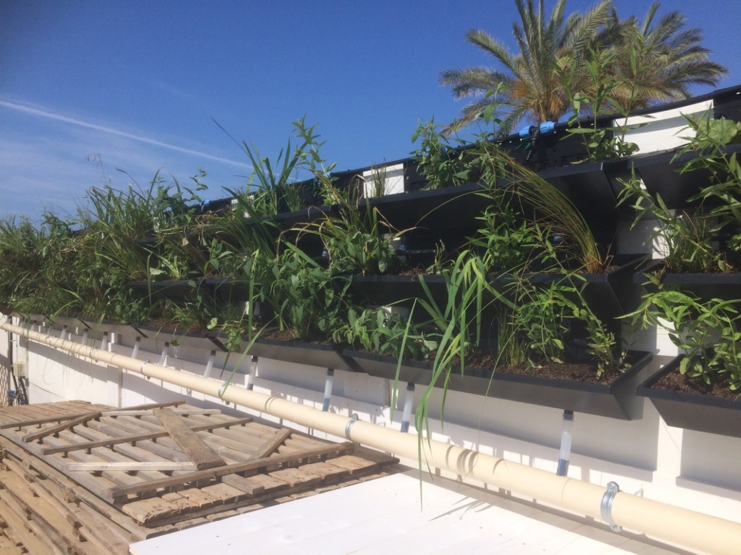 The action provides the recovery of the lightly polluted water consumed in the external showers for irrigation and WC flushing; about 350 litres of water per day can be filtered in a green wall. 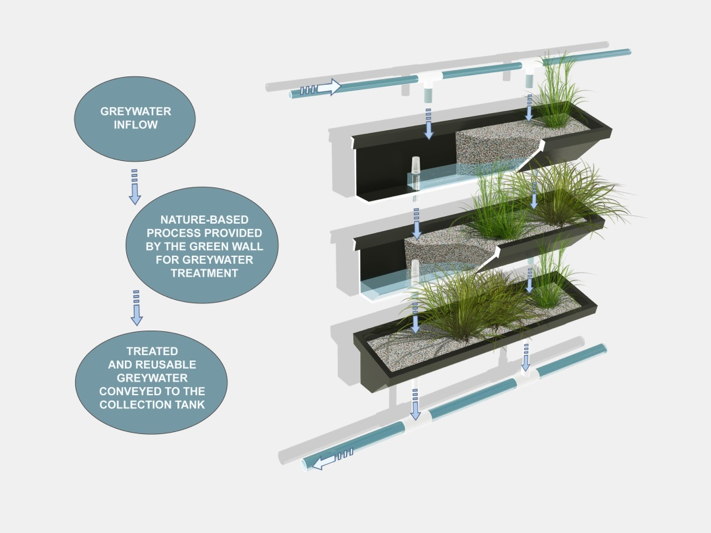 The greywater produced by the showers are collected in a small vessel sized to separate the sand, followed by a pumping system to load the green wall,which permits the filtration and the biological treatment of the water. Different plant species are placed(Iris pseudacorus, Lytrumsalicaria, Juncuseffusus, Carexpendula, Eleocharispalustris, Calthapalustris, Lysimachia vulgaris). The treated greywater is harvested in a plastic tank with a capacity of 1000 litres, from where the water can be reused for irrigation and WC flushing.